“Letters and Bridges” and “Migratory Dreams” are on Net Artizens! This entry was posted in Exhibitions on March 27, 2015 by xadiaz. 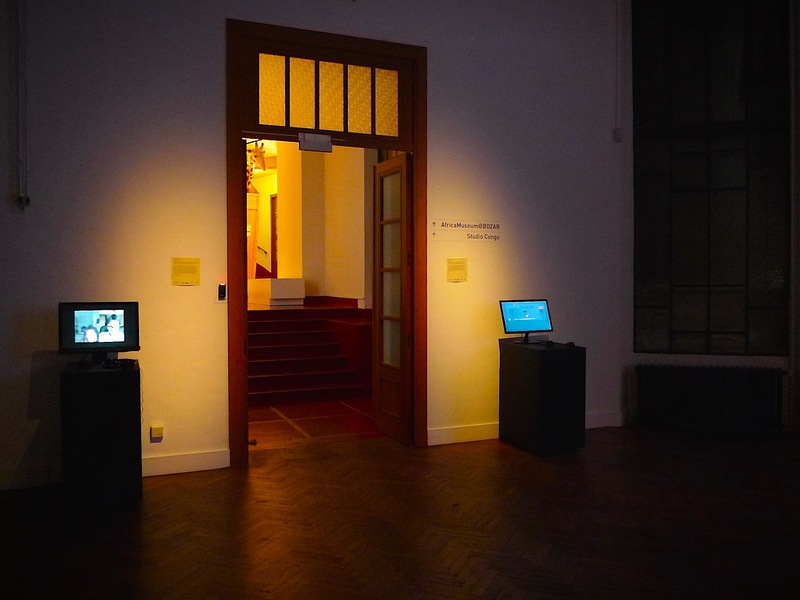 Networked Migrations and Sounding Underground were exhibited on the 25 of September, 2014, in the festival of electronic art Bozart, in Brussels, as part of artworks that engage communities and use ICT. 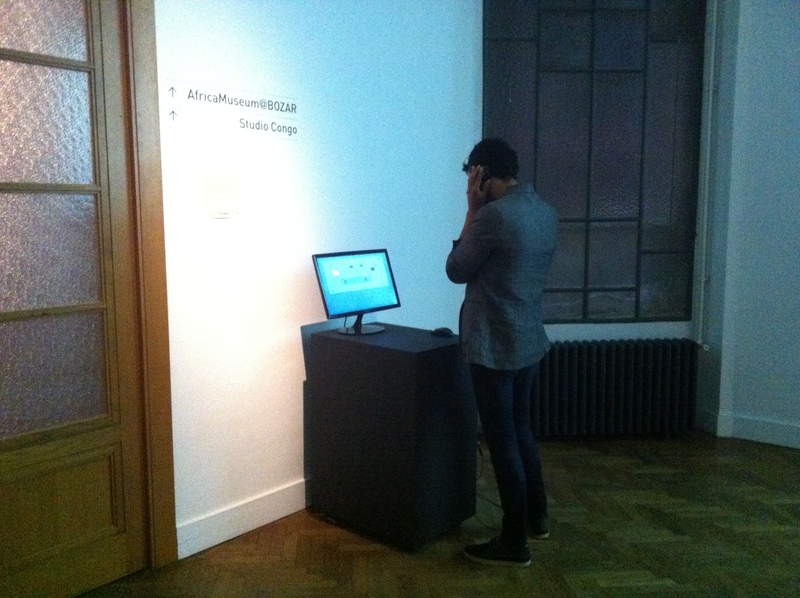 It was a great opportunity to make these works known in Europe, and to be part of ICT Art Connect, where artists have the chance to tell the story of their work and envision future collaborations. This entry was posted in Exhibitions on October 18, 2014 by xadiaz. Networked Migrations’ academic paper has been published in the Journal Liminalities, as part of a collection of essays exploring Body, Space and Time in Networked Performance, edited by Garrett Lynch and Rea Dennis. 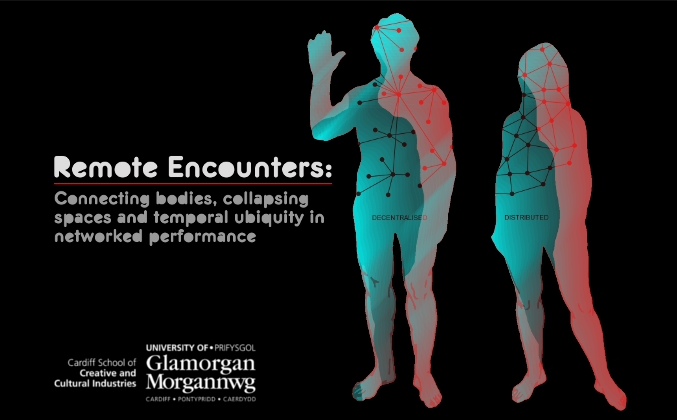 The contributions to this issue have been compiled from the outcomes of the international conference Remote Encounters: Connecting Bodies, Collapsing Spaces and Temporal Ubiquity in Networked Performance held at the University of South Wales on the 11th and 12th of April 2013. This entry was posted in Publications on May 21, 2014 by xadiaz. 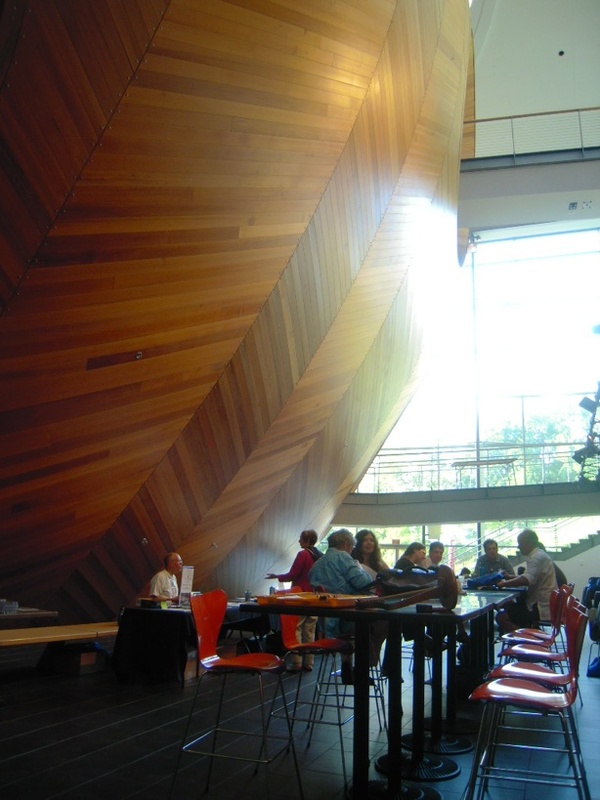 I had the opportunity and the pleasure to attend the first International Deep Listening Art/Science conference in Troy, NY, at the Experimental Media and Performance Arts Centre – EMPAC, organised by the Deep Listening Institute and the Rensselaer Polytechnic Institute. It was an unusual conference, where people gathered to talk, but with the premise of listening deeply. I perceived this at all times, during the talks, performances, workshops and even during the lunch time. Previously I’ve heard and experienced in similar events that listening is demanding and therefore a tiring experience. After three days of continuous Deep Listening to lectures, workshops, performances, listening walks, poster sessions and round tables, I just wanted to listen more and more; I wanted an ever-lasting conference! I was fully energised, not exhausted (even in very high temperatures); this is because Deep Listening invites you to open not only your ears and intellect, but also your full body, to listen. 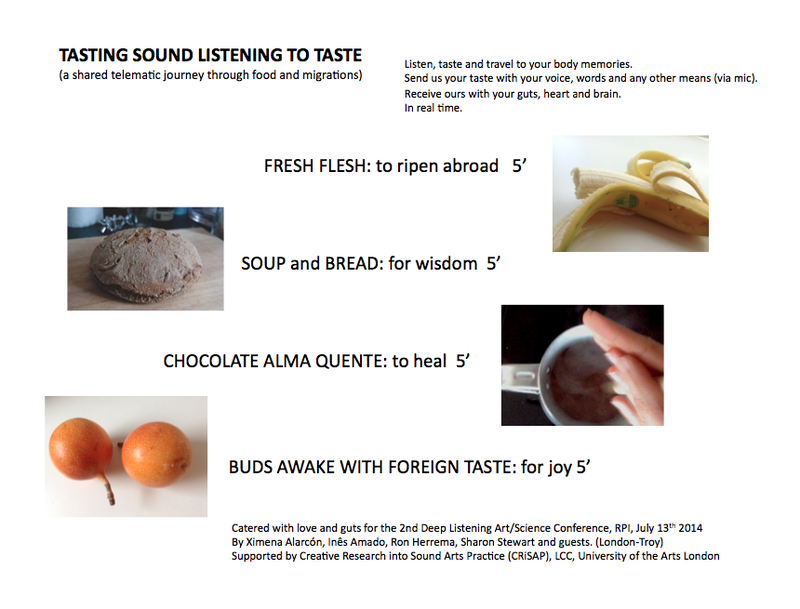 As Pauline Oliveros stated in a round table discussion, listening is not about training the ears but about training the brain. When all sound flows through the body, because of our attentional dynamics, inner and outer perception combine in a delicious feeling which Pauline refers to as homeostasis, an equilibrium which is reached in the space/time continuum of sound, and creates the sensation of being inside of a musical piece that we customise as we listen, compose and perform; we are the music and the instrument for the music. What was my music made of? It was made of every single paper and performance I heard, the workshops in which I participated, and the ‘sparks’ that these created in my stream of consciousness and knowledge. These ‘sparks’ were present in the anticipations and the surprises, in the non-thinking that occurs when I am performing guided by intuition, by listening, by flow. My own sounding materialised in my ‘Networked Migrations’ paper, and my participatory performance ‘Spider whispers’. The first one flew gently and used the right pace, as I felt listeners tuned into those in-between spaces (migratory and telematic), and into other unnamed spaces of sound. ‘Spider whispers’ was incredibly playful and sonically rewarding. I felt fear when I was standing in front of my audience/performers (I had never done this before, and never with so many people), but I said it, and we laughed and I felt we opened to the idea of becoming spiders, and connecting and bringing our own fears, love and laughter, our extreme fears, strange love and timid laughter that spiders provoke; we were connected. Wired for Sound by Jay Kreimer at the Deep Listening Conference, 2013 from Ximena Alarcón on Vimeo. This entry was posted in Conferences on August 6, 2013 by xadiaz. 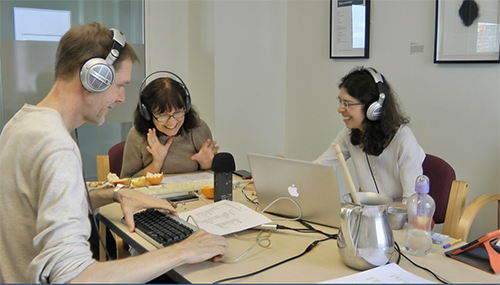 On the 12th of May, I was invited to talk about “Migratory Dreams” in Latin Waves, the first radio programme in the United Kingdom devoted to Latin American avant-garde music from its roots, in Resonance FM. I had an interesting conversation with the journalist and music lover Javier Chandía, the creator of the space, about the ‘in-between’ space and how that concept/feeling is manifested in our dreams, and in our migrations. I shared with Javier, who is also a latinoamerican migrant, that “listening has been the way to connect to the things that I miss” and listening has accompanied my migration; it’s a key faculty that allows my expansion and my feeling of belonging in foreign territories. We also talked about the feeling of being foreigner in our native countries, and the difficulties to understand our multiple identities, which the migratory condition makes explicit. In “Migratory Dreams” there are “shared aspects of migration” which sound in sonic layers that we can perceive and feel. El 12 de Mayo, fui invitada a hablar sobre “Sueños Migratorios” en el espacio Latin Waves de la emisora Resonance FM, el primer programa radial en el Reino Unido dedicado a divulgar música latinoamericana de vanguardia desde sus raíces. Tuve una conversación muy interesante con el periodista y amante de música experimental Javier Chandía, el creador de este espacio, sobre el ‘espacio intermedio’ y cómo este concepto/sentimiento se manifiesta en nuestros sueños y en nuestras migraciones. Compartí con Javier, quien es también un migrante latinoamericano, que “escuchar ha sido mi forma de conectar con las cosas que extraño” y escuchar ha acompañado mi migración; esta es una facultad clave para permitir mi expansión y mi sentido de pertenencia en territorios extranjeros. También hablamos del sentimiento de ser extranjeros en nuestros países de origen, y las dificultades para entender nuestras múltiples identidades, las cuales se hacen explícitas con la condición migratoria. En “Sueños Migratorios” hay “aspectos compartidos de migración” los cuales suenan en capas sonoras que podemos percibir y sentir. This entry was posted in Features on June 19, 2013 by xadiaz.